BLACK POINT. This residence was designed to satisfy the client's request for a period style reminiscent of old Hawaii and the early missionary architecture that echoed the seaside homes of the Massachusetts coast. Of particular interest was the use of a bay window tower. Adams Design created the drawings for integrating these period elements as well as enhancing the interior space plan for better utilization of available space. 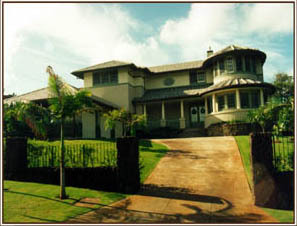 MANOR KAHALA. The client was interested in the Georgian period of design and desired a residence that reflected that era. This was a more formal and symmetric plan with many decorative elements of molding, trim, gutter downspouts, bay window treatments, and miniature balconies for planting. The interior scheme was also more formal and featured a grand staircase in the entry foyer, and a recessed living room centered on a magnificent fireplace which provided a focal point beyond the foyer. Each room aligns with the next in a way which captures views of contrasting intimacy of each space with the juxtaposition of the long view of spaces in sequence.